We have been putting Sweet Pea to bed in her crib for naps and night-time for about eight months now. She spent the first nine to ten months of her life sleeping in our room, either in our bed or in the sidecar co-sleeper, then we slowly moved to putting her down in her crib in her own room. Right now, she starts out the night in there, then comes to bed with us (sometime between 1:00 and 5:00 AM) and nurses occasionally through the rest of the night. We aim for bedtime by 10:00 PM, and hang out in the living room with her, nursing, rocking, and listening to her bedtime mix CD, until she falls asleep. Lately, Average has been able to get her to sleep by simply laying down on the couch with and holding her. Sometimes he falls asleep this way too, which pushes back our bedtime to later than we'd prefer. I feel like we could have an easier bedtime routine if we had an actual bed for her to sleep in in her own room. That way, one of us could lay down in there with her until she fell asleep, then sneak out. And the rest of the house wouldn't necessarily have to be dark and quiet the way it is now. Currently, whoever is not holding her while she falls asleep is either sitting in the dark living room, or hiding out in the bedroom with just a bedside light on. If she was falling asleep in her own room, one of us could be doing the dishes at the same time! Or paying bills! Or watching TV! Yes, we have tried laying her down in her crib awake and she does not fall asleep this way. We are not willing to let her cry herself to sleep at this point. A couple of weeks ago we got Sweet Pea a twin bed (mattress and box springs). Actually, my mom got it -- thanks Mom! We do plan to eventually get a frame for the bed, or perhaps Average will make one, but this saved us a lot of hassle and money for now, and the bed is low enough that she can climb in and out on her own, which I think is nice. After dinner, husband Average gives toddler Sweet Pea a bath. They play and laugh together. Average gets Sweet Pea in an overnight diaper and footie pajamas, they might cuddle, read, or play for a few more minutes, then I take over. Sweet Pea picks out a few books. This is new! Up to a month ago, she didn't really enjoy books, but now she loves them! And I love that. We lay in her bed together and read books until I get tired of repeating the books or until she asks for milk. She now has both a hand sign and a verbal word. She nurses until she falls asleep, then I get up and put the pillow on the outside edge of the bed to help prevent her from rolling off, turn on the monitor, and quietly leave the room. Or, sometimes she finishes nursing and we cuddle until she falls asleep. Or, she is too wound up to fall asleep, and I have to call for a sub. Average comes in and does his thing (rocking and music) and she falls asleep. I go to bed in my own room, or go watch a movie, or finish cleaning up, or whatever. I am really happy with this new arrangement. Sweet Pea ends up sleeping in her room for more time overall, and the whole house doesn't have to shut down to get her to sleep. In just a week or two, she has adjusted to this routine and is doing great with it. She even slept through the night last night! Eighteen months might seem a little early to move to a real bed, but it seems to be working out for us. I'm curious what other parents are doing. Please, share your stories in comments! One day of the class I took this summer (required to maintain my teaching license) was a day of field trips. Some people went rafting, some toured a farm, some visited a lumber company. I signed up to visit a water treatment plant, a hydroelectric dam, my local dump, and a home goods and construction recycling construction center. I learned a lot from each place, but the thing that probably left the biggest impression on me was visiting the dump and watching people pitch perfectly good, or at least recycle-able, items into the pit. We have made many trips to the dump, with broken items and true garbage. But in the few minutes I stood looking into the pit, I saw someone toss in a wheelbarrow, a massive pile of wood, soil, and empty boxes. The wheelbarrow did have a small hole in the bottom, but appeared to be functional other than that. I know it wheeled just fine because it fell off the top of the person's pickup truck when they made a tight turn, and someone in my class wheeled it back to them. We collectively gasped when the person then shoved it over the side of the dump into the pit. Wood and soil are both recyclable, and that person could have been tossing those wood pieces into a giant dumpster about 20 feet away, to be taken to be used as fuel instead of added to the landfill. Soil, or "fill dirt" could have been taken by many people who want to fill in their yard's low spot. I know this because after our garden project I offered free fill dirt on Freecycle and Craigslist, and more people replied than I could supply, and our driveway was quickly emptied of the dirt we didn't want. There is also a company in our town that takes all yard waste, including sod, dirt, concrete, and plant matter, and recycles it into products that it then sells back to consumers. Think about how much better these options are than driving your items to the dump, where they are then transported (by fossil-fuel burning vehicles) to a landfill either a couple of miles, or a couple of hundred miles, away. 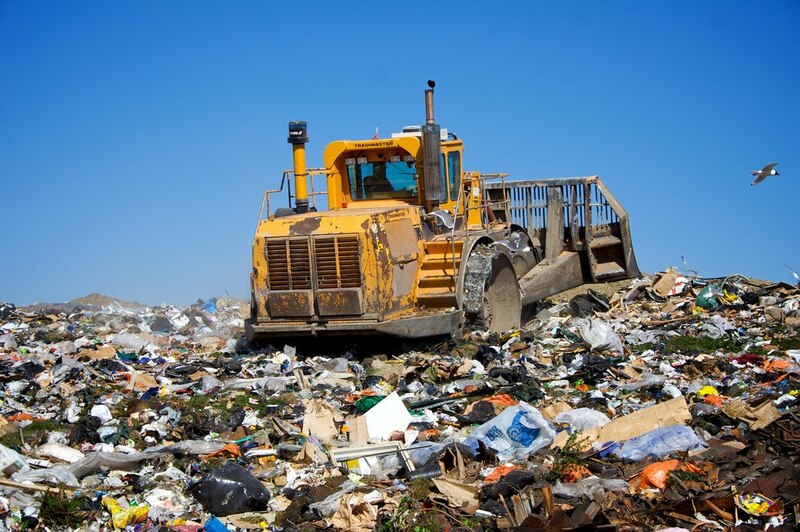 Landfills offgas methane, and pollute the earth and water, no matter how hard they try to contain the poisons. Basically, if you have anything that could be reused or recycled in any form at all, please don't take it to the dump and add it to the landfill! Someone just might want the item that you see as junk or garbage. I mentioned Freecycle and Craigslist, which are my favorite spots for getting and offering cheap or free used items. Freecycle describes itself as a "network to promote waste reduction and help save landscape from being taken over by landfills." People post things they need, and things they have to offer. And Craigslist, well, you probably aren't reading a blog if you've never heard of Craigslist, as it is such a common . I like to check the free page every once in a while, just to see what's there. I have given away cleaning products, a lamp, fill dirt, a water filter, and a few other things on Freecycle, and sold furniture, electronics, clothing, and baby items on Craigslist. It always feels good to know that something I was no longer using is getting a longer life, and/or being used by someone who really needed it! Sometimes I think we can get carried away with the importance of recycling (which I do believe is important), when re-using items is even better than recycling them in terms of saving energy and natural resources. Of course, donating you unwanted things to a charity is a good option too. In college, I spent a semester abroad. I learned a lot about American culture by noticing what was different in other countries. One thing that I grew to appreciate about American culture was our willingness to give old things a second (or third or fourth) chance through re-sale shops, consignment shops, online selling and sharing, donations, and the good old free pile by the curb. Perhaps because I live in a university town that prides itself on being green, but there are free piles here all the time -- of extra garden produce, leftover moving supplies, furniture, albums, you name it, I've probably seen it free. In Spain, where I lived for five months, there were no free piles, and no Goodwill or consignment shops. When I asked a Spanish friend about what I should do with the clothes I didn't want to pack around for the rest of my European travels, he said I could throw them away or donate them to a church that would give them to the poor. Several of my friends and I donated our clothes before we left, but were surprised there were no other options. Perhaps it isn't this way in all of Spain, but it certainly made me appreciate my local culture's ability to REUSE goods until they are no longer useful or usable. Although many people clearly aren't doing it, as evidenced by my visit to the dump, the opportunity is there. What's it like where you live? Have you given or gotten some great used items recently? When we spent a few days at a cabin last month we used a disposable diaper product on Sweet Pea for the first time. We knew we were going to spend more than a day driving, and then several days at a cabin with no washing machine, so we thought this would be one time when using purely cloth diapers might be just too much for us. Maybe we are just wimps because Average's aunt had a great story for us about backpacking with a baby in diapers and washing them in a plastic bag in a hole she would dig in the ground. Now that's commitment! Back to our story though. We decided to go with a hybrid system: a disposable absorbent liner with a reusable cover. gDiapers are available at grocery stores in our city, so we thought that would be an easy option, and actually the only option since we didn't leave ourselves delivery time for ordering anything online. I had also read good reviews of the gDiaper inserts. We put the first one on Sweet Pea just before we left our house in the afternoon. When we stopped for a break a couple of hours later, she had leaked onto her pants. We are pretty certain that was due to user error, though, as some of the insert wasn't tucked all the way into the cover. After that, we didn't have any trouble with leaking at all. We used a variety of covers including a snapping one-size Flip diaper cover , and Thirsties size medium covers. Sweet Pea did great in the gs for the next 3-4 days while we were away from civilization, and we tore them up and flushed them down the toilet (gDiapers are flushable and compostable) in some places and simply threw them in the trash in other places. I did find I felt a sense of freedom in not having to pack so much bulk with us, and Sweet Pea never got a rash with them. They worked fine overnight as well. I was enjoying using the gDiapers so much, I began to question my own commitment to cloth. Once we reached a place with a washing machine we switched back to our cloth diapers. I did feel like I needed to change Sweet Pea more often back in cloth, and had to remember to always have a wet bag with me. But when I was folding my beautiful fitted diapers after running our first load of laundry, I felt a strong sense of satisfaction, just enjoying the feel of the soft bamboo velour inners and the cute prints. While the gDiapers were easy, they did smell funny to me -- worse than our cloth. Even when a microfiber insert really needs a good soak it doesn't have the icky chemical smell that a disposable has to me. In conclusion, we had a good experience with our first time using a disposable diaper product on Sweet Pea, but I am just as happy as even with our choice to cloth diaper our child. We are thinking of working on potty learning soon, and I'm sure I'm going to miss our diapers when we are done with them (although I'll be glad to have less laundry)! A week passed and no one has entered. So, once I get 10 entries, I will draw for a winner. Anyone want a free book? I have always enjoyed participating in and even winning a couple of giveaways from my fellow bloggers, and have had in the back of my mind that I'd like to offer more giveaways to my readers. I have an item that I think some of you might be interested in, here, that a friend recently passed on to me. I already had one so I thought I would share it. It is one of my favorite books and pregnancy and birth: The Complete Book of Pregnancy and Childbirth by Sheila Kitzinger. This book covers the week-by-week changes of the pregnant body, and includes beautiful photos of home and hospital births. As the name suggests, it is a pretty complete guide to most of the questions that expectant parents encounter, and it couches its answers in non-scary, but accurate, terms. The giveaway will run for a week, so I will randomly pick a number for a winner next Sunday night. To enter, comment with your favorite source of information about pregnancy or birth. 1. Publicly follow my blog and comment for one additional entry. 2. Follow @rosepeck on Twitter and comment for one additional entry. You may also tweet once a day for an additional entry. Leave separate comments with the permalink each time. 3. Comment on a previous post of mine and come back here and comment which one. Limit 5 extra entries. 4. Blog about the giveaway and comment with the URL for two (2) extra entries, leaving two separate comments. A couple of weeks ago we went blueberry picking. Sweet Pea ate every single berry she picked. Last year I battled with the slugs by putting out beer traps for them. This year, we are trying the copper barrier method. We bought many rolls of Corry's Slug & Snail Copper Tape and have put them down around the tops of several of our raised beds. The idea is that crossing the copper gives the little varmints a small shock, so they avoid it. So far, it seems to be working. I think this product is best suited for container gardens because it takes a lot of copper tape to wrap an entire raised bed! I also read a review that said that after a year the adhesive didn't work any more on the wooden beds, which makes sense as water will seep into the wood. We are thinking in another year or two we will put copper pipes around the top of each bed -- a more permanent and attractive solution, but also more expensive. Just yesterday I was talking with my neighbor, and she told me a horribly sad story that reinforced my commitment to avoiding poisons in our yard. A few years ago, she was struggling with slugs in her garden and put out some slug and snail killer pellets, only in areas she thought were inaccessible to her dog. Well, he was able to get to at least one of those areas, ate the pellets, and died that day. According to my research, copper barriers seem to be the safest and most effective method, and also the longest lasting. I have read about diatomaceous earth, and while it seems to be safe, it is less effective in humid environments (according to Wikipedia). There is also the salt method, which seems fairly effective, but then you are adding salt to your soil, which isn't very desirable to me. Also, both of those methods aim to kill the slugs and snails, which isn't really what I care about. I am fine with them existing and eating weeds or grass outside of my vegetable garden, as long as they aren't slime-ing and eating my produce! I am also experimenting with using pennies rather than copper tape. Just setting them around the beds, as shown above on the left of the image, doesn't work because Sweet Pea brings them to me two at a time, so I may try gluing them with wood glue. What's your experience with slugs and snails? Have you found anything else that works? And many others. In the last few days she has started repeating things all the time. This is the point at which we realize "we REALLY need to watch what we say!" I have never been one to throw curse words around, and while Average used to, he doesn't much anymore, at home at least. This new stage of mimicry has just reinforced to me that I need to be mindful of what I say and how I say things to her and to everyone around me. Our children really do learn most from observing us. I am proud that Sweet Pea says "no" sweetly instead of angrily, and enjoys giving hugs and kisses. I think her dad and I can attribute those things at least partly to a positive example, but I cringe when I hear her pretending to talk on the phone with her sharp and to the point "uh, yeah, no, uh" noises. That is pretty much how Average and I sound on the phone to each other at times. At least she has recently added a nice "Heh-woe" at the beginning of her phone talk, which is super cute! My idea is that we should try to be kind and gentle with each other, and use good words that we would want our children to use, and they will follow our model for them. I'm sure a few curse words will get thrown in when Sweet Pea hears them, but planning to try to ignore them when they do. My parents told me I went through a "cussing" stage when I was little but they ignored it and I stopped. For people without kids, do you watch your language around kids? Why or why not? For people with babies and toddlers, have you been thinking about changing how you talk in front of your kids? Or would you not need to? For people with older kids, what have you seen happen as they grow? We are in the middle of World Breastfeeding Week, if you didn't already know. According to the WHO, August 1-7 is celebrated each year "in more than 120 countries to encourage breastfeeding and improve the health of babies around the world." Breastfeeding is the best way to provide newborns with the nutrients they need. WHO recommends exclusive breastfeeding until a baby is six months old, and continued breastfeeding with the addition of nutritious complementary foods for up to two years or beyond. As a nursing mother, I have seen the benefits of breastfeeding to myself and my daughter continue into toddlerhood. At seventeen months old, Sweet Pea typically only nurses a few times a day, especially when we are busy and out and about. Those few minutes of nursing are a nice time to come back together, cuddle, and relax. The last couple of days, however, she and I have both been under the weather and nursing much more often. During these rough nights I have been so glad to be able to comfort and nourish her with breastmilk. It is the quickest, easiest, and generally most beneficial way to soothe her when she isn't feeling well. Also, this is the first time she has been sick besides getting a cold in the winter, which I feel I can partially attribute to breastfeeding. For your enoyment and edification, here is a video from UNICEF, which sheds some light on the importance of breastfeeding around the world. On the YouTube page for this video, you can read a variety of opinions about the length of time a mother should continue breastfeeding. I wanted to go beyond a year, and have accomplished that, but beyond this point I have no specific plans. I figure I'll know when it's time to stop. My opinion is that it is a very personal choice based on the needs and wishes of each mother-baby pair, and the circumstances they are in. Whether a mom chooses not to breastfeed or can't, or chooses to breastfeed into childhood, every mother deserves respect for her choices. The important thing to me is that all who wish to breastfeed have the necessary information and support.